The late Spalding Gray (he died in 2004 of an apparent suicide) was most famous for autobiographical monologues that he performed theatrically in the 80s and 90s. The popularity of his monologues led to those being performed as the feature films Swimming to Cambodia, Monster in a Box, and, arguably, his most famous work, Gray�s Anatomy. Directed by the great Steven Soderbergh (Traffic, Out of Sight), Gray�s already engrossing storytelling techniques are taken to another level by the visual flair and unique style of one of our best American filmmakers. Also taken to another level is the film itself, thanks, once again, to The Criterion Collection. Their new Blu-ray disc not only presents the film in the best way it�s ever looked or sounded, but it also sports an extras collection that includes one particularly �original� supplement, and another that could have easily been released as a separate DVD, rather than thrown in here. I remember seeing Gray�s Anatomy when it debuted on home video, and I was bored to death by it. It�s funny what a difference 15 years can make, because after seeing the film on this new Criterion Blu-ray disc, it�s as if I�ve seen a totally different film. For example, I have no idea why I can�t remember any of the interview segments that Soderbergh filmed with various Americans that have faced horrible eye-related medical conditions not unlike that which is the �focal� point of Gray�s monologue. Originally intended as filler, these sequences prove to be some of the most powerful stuff in the film, with a few of them making it difficult to keep the tears at bay. The decision to include these and Soderbergh�s choice to place Gray in different set pieces versus simply having him sit at a desk as he did in the theater are what set Gray�s Anatomy apart from the other two films that have showcased Gray�s monologues. Despite the aforementioned wonderful work from Soderbergh, this is still Spalding Gray�s show, and he never disappoints when he�s on-screen, which is most of the 79-minute running time. While he�s never one to shy away from going off on ranting tangents, the basis of Gray�s storytelling here is a strange eye ailment that he was diagnosed with called a Macular pucker. Terrified of the cringe-inducing surgical procedure that was required to cure him, Gray tells us about the rather crazy-sounding alternative methods he chose to explore in an attempt to avoid such an invasive operation. It is the retelling of these alternative explorations that the genius of Gray�s Anatomy lies within. Gray�s recount of his experience in a Native American sweat lodge is just downright hilarious as our candid narrator lets loose about just how ridiculous he felt in this setting. The best segment of the film, however comes near the end and involves Gray�s talk about his trip to the Philippines to visit �the Elvis Presley of psychic surgeons.� As off-the-wall as this particular story is, the fact that it is true only adds to just how compelling it is. I laughed quite a bit during this segment, as well, but, I was never really sure whether I was laughing with Gray�s recounting of this, or if I was laughing at him for believing that seeing such a zealot for an eye problem was ever a good idea to begin with. 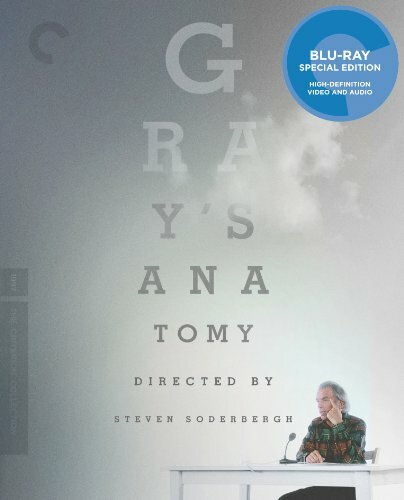 Gray�s Anatomy has never looked as good as it does here, presented in its original 1.85:1 aspect ratio, via a 1080p transfer, supervised by Soderbergh from a 35mm interpositive. The film�s numerous close-ups exhibit excellent image detail, and accurate flesh tones, which always work in perfect tandem with a wonderful color scheme that often features extreme use of red, blue, and other hues that never bleed. The DTS-HD Master Audio 5.1 track opens the sound field to really let Cliff Martinez�s excellent score breathe and enables it to sound more powerful than it ever has. Gray�s fast-paced dialogue delivery is always crystal clear, crisp, and easily decipherable; an extremely important plus for a film of this nature. The extras collection starts off with a great 12-minute interview with director Steven Soderbergh that took place in New York this past March. This insightful piece has him discussing �The Schizopolis/Gray�s Period,� and how it was an important rebirth of his career, and then moving on to focus on Gray�s Anatomy and Spalding Gray, himself. Next, is an 18-minute interview (also conducted in March of 2012) with Gray collaborator, Ren�e Shafransky, who worked with him on Swimming to Cambodia, Monster in a Box, and Gray�s Anatomy. Believe it or not, Swimming to the Macula is 16 minutes of actual footage from Spalding Gray�s macular surgery. There�s no sound here, as it is presented unedited, but that also means that anyone who is even remotely squeamish about such things should skip this supplement. The trailer for Gray�s Anatomy is also on board, but the highlight of the extras is A Personal History of the American Theater, one of Spalding Gray�s most famous monologues. Presented here in its entirety (97 minutes) and filmed by Dan Weissman and Brad Ricker at the Performing Garage in New York City on November 28, 1982, this piece single-handedly makes this Criterion Blu-ray a must-buy for Gray fans.